Hyginus was placed in the chair of Saint Peter after the martyrdom of Saint Telesphorus, in the year 139. Eusebius informs us, that he sat four years. The church then enjoyed some sort of calm, under the mild reign of the emperor Antoninus Pius; though several martyrs suffered in his time by the fury of the populace, or the cruelty of certain magistrates. The emperor himself never consented to such proceedings; and when informed of them by the governors of Asia, Athens, Thessalonica, and Larissa, he wrote to them in favor of the Christians, as is recorded by Saint Justin and Eusebius. But the devil had recourse to other arts to disturb the peace of God’s church. Cerdo, a wolf in sheep’s clothing, in the year 140, came from Syria to Rome, and began to teach the false principles which Marcion adopted afterwards with more success. He impiously affirmed that there were two Gods; the one rigorous and severe, the author of the Old Testament; the other merciful and good, the author of the New, and the father of Christ, sent by him to redeem man from the tyranny of the former; and that Christ was not really born of the Virgin Mary, or true man, but such in shadow only and appearance. Our holy pope, by his pastoral vigilance, detected that monster, and cut him off from the communion of the church. The heresiarch, imposing upon him by a false repentance, was again received; but the zealous pastor having discovered that he secretly preached his old opinions, excommunicated him a second time. Another minister of Satan was Valentine, who being a Platonic philosopher, puffed up with the vain opinion of his learning, and full of resentment for another’s being preferred to him in an election to a certain bishopric in Egypt, as Tertullian relates, revived the errors of Simon Magus, and added to them many other absurd fictions, as of thirty aeones or ages, a kind of inferior deities, with whimsical histories of their several pedigrees. Having broached these opinions at Alexandria, he left Egypt for Rome. At first he dissembled his heresies, but by degrees his extravagant doctrines came to light. Hyginus, being the mildest of men, endeavoured to reclaim him without proceeding to extremities; so that Valentine was not excommunicated before the first year of Saint Pius, his immediate successor. 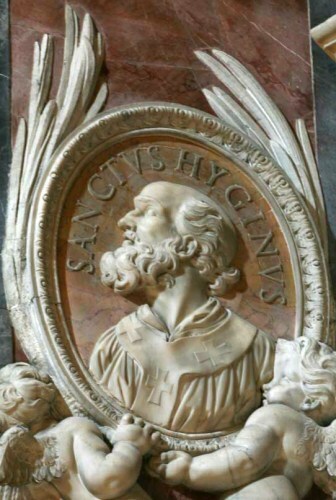 Saint Hyginus did not sit quite four years, dying in 142. We do not find that he ended his life by martyrdom, yet he is styled a martyr in some ancient calendars, as well as in the present Roman Martyrology; undoubtedly on account of the various persecutions which he suffered, and to which his high station in the church exposed him in those perilous times. From The Lives of the Saints. Volume I: January. 1866.